The first of the seven sacraments, and the "door" which gives access to the other sacraments. Baptism is the first and chief sacrament of forgiveness of sins because it unites us with Christ, who died for our sins and rose for our justification. The sacramental celebration in which, through God's mercy and forgiveness, the sinner is reconciled with God and also with the Church, Christ's Body, which is wounded by sin. “I am the living bread that came down from heaven; if any one eats of this bread, he will live for ever; . . . he who eats my flesh and drinks my blood has eternal life and . . . abides in me, and I in him” (Jn 6:51, 54, 56). And as they were eating He took bread and blessed and broke it and gave it to them and said, ‘Take, this is my body.’ And He took a cup and when He had given thanks, He gave it to them and they all drank of it and He said to them, ‘This is my blood of the New Covenant which is poured out for many (Mark 14: 22-24). 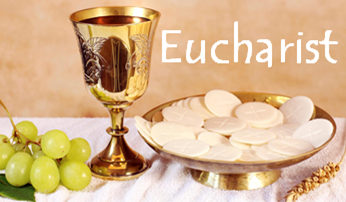 The ritual, sacramental action of thanksgiving to God which constitutes the principal Christian liturgical celebration of and communion in the paschal mystery of Christ. Confirmation completes the grace of Baptism by a special outpouring of the gifts of the Holy Spirit, which seal or "confirm" the baptized in union with Christ and equip them for active participation in the worship and apostolic life of the Church. A covenant or partnership of life between a man and woman, which is ordered to the well-being of the spouses and to the procreation and upbringing of children. Please call the office for updated information (928) 782-7516. Por favor llame a la oficina para obtener información actualizada (928) 782-7516.